(Toronto, Ont.) Germany, the Netherlands, Canada and the USA remain flawless in their pool, rounding off victories during Game 3 on their path to the top spot in their respective pools at the 2014 Women’s World Wheelchair Basketball Championship. The Netherlands improved to 3-0 in round robin play of the 2014 Women’s World Wheelchair Basketball Championship on Sunday morning with a 71-32 victory over Mexico. Mexico started off strong, staying with the powerful Dutch squad through the first half of play to start off Day 3, only trailing 37-21 after 20 minutes. The second half would be a much different story, with the Netherlands silencing the first half Mexican offence while putting up points of their own. The Netherlands showed their depth in this matchup, outscoring Mexico’s bench 19-2 throughout the game. Both Inge Huitzing and Mariska Beijer had 18 points for the Netherlands to lead their offensive charge while Estrada was Mexico’s top scorer with 22 points. Despite the loss, Estrada saw a lot of positives in her team’s play. Both teams continue their round robin play on Monday, with the Netherlands taking on the USA at 6 p.m. and Mexico taking on Australia at 3 p.m.
No. 2 ranked Australia held off a strong attack by No. 10 France and posted a 59-47 win at the Mattamy Athletic Centre on Sunday morning. The Day 3 contest saw France get off to the early lead making it 10-7 after 10 minutes. Australia would readjust in the second quarter, going on an 11-3 run to stop the bleeding and put them in front by four at half time. The game would remain close in the third quarter, with France not backing down, and after a nice layup held a 30-29 lead at 3:31 to force an Australian timeout. The fourth quarter would be a true testament to the Australian’s bench as they pushed ahead to give their team the advantage. Australia’s bench finished the game with 40 points. Montet adds that his team just was physically exhausted come the end of the game. Amber Merritt was brilliant for Australia with a team high 27 points and nine rebounds. Angelique Pichon had a team-high 25 points for France while Emilie Menard had a great game overall and posted 10 points, seven assists and five rebounds. Australia improves to 2-1 with the victory while the loss drops France to 1-2. Australia plays Mexico at 1 p.m. on Monday while France takes on Peru in Day 4’s first game at 8 a.m. The USA showed their dominance on Day 3 of competition, defeating Peru, 93-14. All of USA’s players got action in the game with Kimberly Champion leading the way with 17 points. Rose Hollermann shot 86 per cent (16 points) while Rebecca Murray and Courtney Ryan each added 14. Peru had a big second half, scoring 12 points and was led by Pilar Jauregui who had 10 points. USA has a big game on Day 4 (Monday) when they take on the Netherlands in Pool A action, while Peru tips-off against France at 8 a.m. 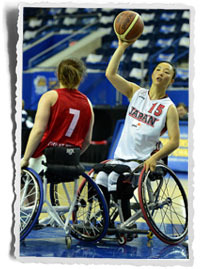 The host nation remained perfect with its third win in as many days to begin the 2014 Women’s World Wheelchair Basketball Championship. Canada never trailed in the contest en route to a 76-53 victory over China. A quick 10-2 spurt by the Red and White less than four minutes into the opening period set the pace for the match. Canada led 18-10 heading into the second quarter, but a tenacious Chinese side battled back to cut into the deficit. The pair of Janet McLachlan and Katie Harnock responded by scoring 19 of Canada’s next 23 points to push the lead to 43-26 at halftime. The Canadian offence continued its strong play in the third to build a 62-39 advantage. China remained competitive throughout the match, but could not push past the home side’s commitment to both ends of the court. McLachlan – the Player of the Game – completed the day with her third double-double of the tournament after posting 27 points and 17 rebounds. Quebec City, Que. native Cindy Ouellet showcased her all-around game by notching 20 points, nine rebounds and 12 assists – a new personal best in major tournament play. China’s Yong Qing Fu led her side with 15 points and nine rebounds while Yun Long (14) and Jia Meng Dai (10) also scored in double digits. Team Canada will face a stiff test against No. 1 Germany at 8 p.m. to close-out the fourth day of competition. China will look to even its record at 2-2 with a 10 a.m. match against Great Britain. Germany continued its winning ways at the 2014 Women’s World Wheelchair Basketball Championship with a 74-40 decision over Brazil – who has now fallen to 0-3 in the tournament. Team Brazil remained in striking distance, down 12-8 with 2:30 remaining in the opening quarter, but Germany closed out the frame with a 9-2 run to pull away. The European side turned up its offence in the second and posted 29 points to lead 50-18 at the break. Brazil’s struggles with Germany’s efficent offence continued in the third as the latter extended its advantage to 65-28. Germany shared the ball well and consistently made the extra pass in hopes of finding an open player, leading to 30 assists on 35 field goals made. Team Germany was led by Hamburg’s Mareike Adermann, who earned Player of the Game honours by filling the stats sheet with 29 points, 19 rebounds, six assists, three steals and a pair of blocks. Brazil’s Lia Maria Soares Martins answered with 12 points and five rebounds. Two undefeated teams will look to extend their streaks when Germany and Canada clash for pool B supremacy tomorrow at 8 p.m. to close day four. Brazil will search for its first win against Japan at 1 p.m.
Great Britain improved its record to 2-1 following a competitive contest against Japan to conclude the third day of the 2014 Women’s World Wheelchair Basketball Championship. The back-and-forth battle saw the European side come away with a 62-48 win. The hard-fought affair began with both sides trading chances and looking to establish their rhythms. 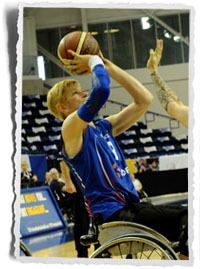 Great Britain came out of the close quarter sporting an 18-10 advantage. An even second period saw the British side maintain its six-point lead to enter halftime at 28-22. Great Britain emerged from the break with a renewed focus on its defensive play and limited Japan’s shooters to eight points in the frame. Trailing 45-30 to enter the fourth, a tenacious Japan fought back to take the quarter 18-17. Judith Hamer of Exeter led the way for Great Britain with 26 points and seven rebounds. Mari Amimoto had another solid performance for Japan, notching 25 points, seven rebounds and eight assists on the evening. Great Britain will next face-off against (1-2) China tomorrow at 10 a.m. Japan will face Brazil at 1 p.m. as both teams search for their first victories of the competition.